I never ever considered that I would end up being an activist. Like, ever! Jump back to three years ago and I barely recycled anything other than paper, glass bottles or plastic bottles. Yet, here I am, helping run a campaign to get plastic bags banned in my adopted state of Victoria. Well not an entire ban - we are starting with asking for ban on limited-use plastic bags distributed at retail points of sale in Victoria. Lucky, I am working with an energetic and knowledgeable group of people, that have in a short amount of time, gone above and beyond to get this state wide campaign running. No one is paid to do this, it's done out of passion. We had our first workshop a month ago, where we nutted out the plans for our campaign. Since then we organised a petition. This was a fidly process - there are rues and regulations that go into submitting a petition to government legit. If it's in any way inaccurate, then it won't be considered. To get the petition to parliament, 10,000 signatures need to be collected. We had our petition signed off the week of the climate march in Melbourne (27 Nov). Members of the group headed to the march and gathered 1,000 signatures. We have 9,000 to go. We cannot do an online petition - they do not hold up in the Victorian State Parliament. They are great at raising awareness but not so great for what we want to achieve right now. Already businesses and individuals have asked for the petition too. Soon, people around Victoria will be able to check the Plastic Bag Free Victoria website and locate where petitions can be found. At the moment we only have a facebook page and instagram. The campaign is not solely about gaining signatures. While we are aiming to beat Plastic Bag Free NSW efforts, they got 12,472...we want to get more....state rivalry ;). 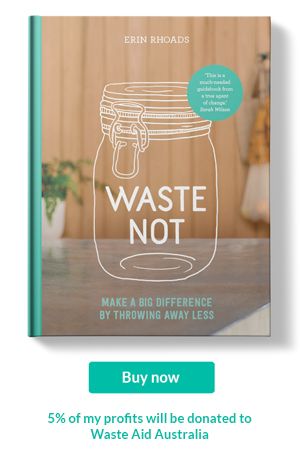 It is also about raising awareness for reusable bags, showing alternatives to bin liners, and generally showing how to live without any plastic bags in general without scaring people. The last thing we want to do is build a campaign on fear. We are joining with local communities that are either plastic bag free or are working on their own campaigns of which there are many. We have our second workshop this Saturday, all details are here. I would love LOVE to have you visit :) This workshop will focus on education and community awareness, plus talking about the website. Don't worry, you don't need to be at the workshop to be apart of the campaign. 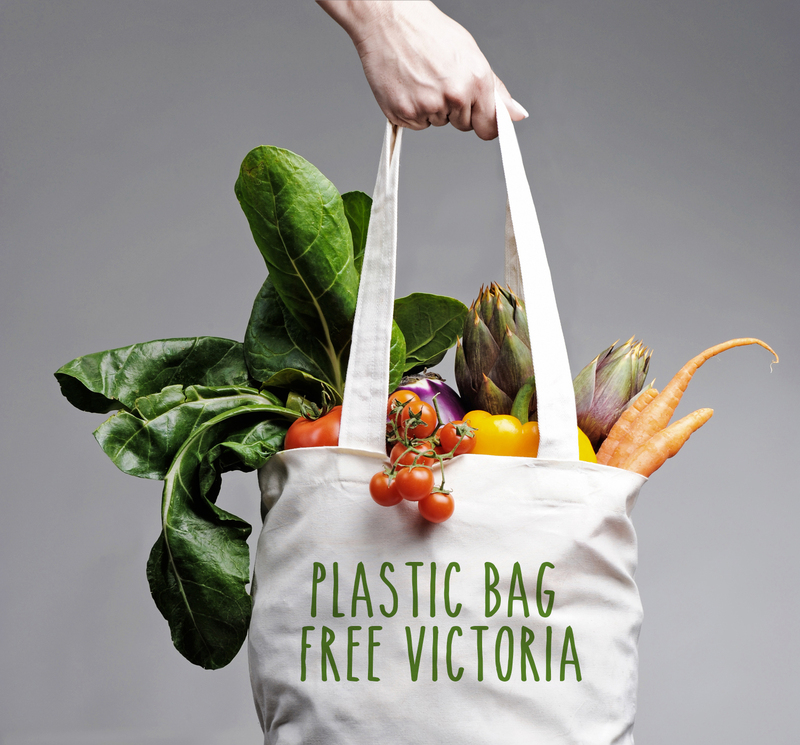 Email us at info@plasticbagfreevictoria.org if you would like to offer help, no matter where you are in Victoria. The plastic bag debate is growing in Australia. South Australia, Tasmania, Northern Territory and the ACT have already enacted bans. NSW, QLD and WA are the states lagging behind. Right now plastic bag bans are a state issue. State Environment Ministers meet in Sydney on December 15th to make some big decisions about tackling plastic bags. Plastic pollution, including plastic bags, is a major threat to wildlife. Globally it is estimated that 1 million sea birds and over 100,000 mammals die every year as a result of plastic ingestion or entanglement. The Boomerang Alliance has created a thunderclap. Thunderclap is a tool that lets a message be heard when you and your friends say it together. Think of it as an "online flash mob." Join a Thunderclap, and you and others will share the same message at the same time, spreading an idea through Facebook, Twitter, and Tumblr that cannot be ignored. It is a one time message and will not be repeated (no spam!). I know people look at things like this, thinking couch activism or slacktivism does nothing...but I believe every little bit helps. The industry groups and politicians do look at numbers. 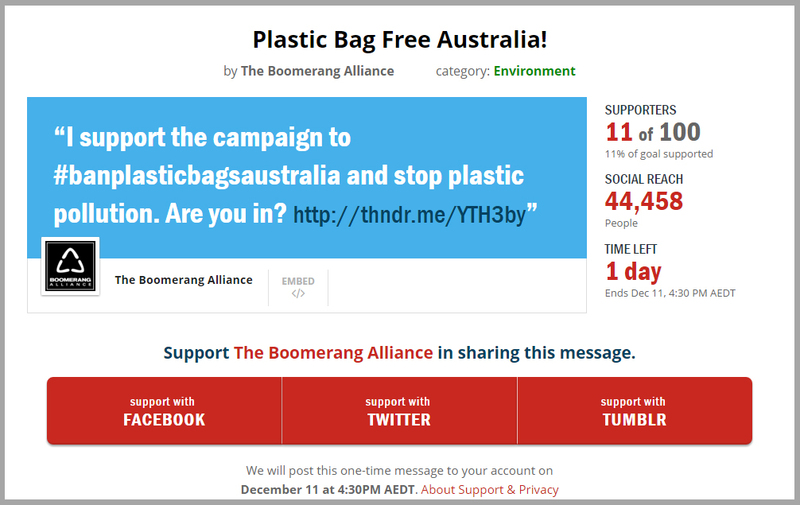 If 20,000 people across Australia have a status or twitter update asking for a plastic bag ban, that is hard to ignore! I plan to share more about the campaign as we move along. It is interesting, requiring alot more than I thought it would. We could comptley fail in our efforts...but if we can convert one person to using reusebale cloth bags, then i'd say that is a win.